‘They’ll want to talk to you,’ her mother says, squinting and raising her hand to shade her eyes. Her skin is sun-dark, mottled with age. Her grey-blonde hair cut short. ‘I can’t sit here, the bloody sun is right in my face.’ She stands and switches her seat to the other side of the table. ‘I don’t see why. I’m not sure I could tell them anything.’ The daughter shifts, the plastic chair flexing and wobbling under her. The paving slabs are uneven, the patio laid by her mother’s ex-boyfriend. A large dragonfly hovers, blue-green and prehistoric over her head. She wonders if it’s true that they can sting. ‘But I wouldn't know what to say.’ She tucks her hands under her knees, pulling her skirt tight to her lap. ‘I only know what you’ve both told me.’ She releases her hands and lays them on the table. They sit for a moment, listening to next door’s radio through the fence, the children a few doors down shrieking and playing. Her mother reaches over the table for her packet of cigarettes and lighter. She lights one, draws hard and tips her head back, blowing smoke in a stream straight up towards the sky. ‘Want a tea? Or a beer?’ she asks. Her mother vanishes into the cool dark of the house, leaving her cigarette burning in the glass ashtray. The daughter turns her chair and looks out over the garden, a rectangle of grass bordered by a thin line of petunias, geraniums and nasturtiums in bright oranges and purples. A lone rose bush grows in the corner, pale lilac. Its flowers are as big as fists, knocking against the hazy air. She slips her feet out of her shoes and spreads her toes over the hot concrete. She thinks about what she does and doesn’t know and how many versions of these stories exist. She thinks about visiting the house, parking the car outside. Walking up the path, past another lilac rose bush, symmetrical lavender bushes and box hedges. He had opened the door, his resemblance to her mother a surprise. Which was stupid – they’re brother and sister; he is her uncle, after all. But it’s only now, as they are getting older, that they are looking more and more alike – less overtly male and female, perhaps. She followed him into the house, into the front room where her grandparents sat in their armchairs, facing the TV. ‘Want a coffee or tea?’ he’d asked. ‘No, thanks,’ she’d said. They drink and the mother finishes her cigarette before lighting another, the smoke turning and pushing up above her head, a dry cloud floating before undoing and dissolving. ‘I never was much of a sun worshipper.’ She smiles at her mother. ‘The house martins are back again.’ Justine says. ‘Hmmm.’ Her mother turns to look up at the mud nest cupped under the eaves of the house. ‘Regular as clockwork, they are. Every year they come back. Funny how little things like that make me so happy nowadays.’ She turns back, closes her eyes and tips her head back to face the sun. Her uncle was in the kitchen, making lunch. The smell of boiling vegetables oozed into the room. ‘How’s the doctoring going?’ her grandmother asked. ‘Good thanks, Nan,’ she’d said, thinking about the half-written paper she couldn’t finish and the lectures she couldn’t write, the students waiting outside her office to complain about their grades, the staff-room politics she seemed unable to grasp. ‘We’re so proud of you, babe. Ain’t we, Den? All them degrees and exams.’ Her grandfather slept on in his chair, his head heavy as an autumn fruit. It was stuffy, the windows shut against the summer,,the commode leaking a faint whiff of pee. A wooden dresser took up most of the wall opposite the window, its surfaces and shelves cluttered with ornaments and children’s drawings and family photos. Justine walked over to it and picked up a small bird, pressed from clay and finger-painted green. Birds swoop and drop like paper darts flung from windows, grabbing insects from the air. Justine can feel the skin on her shoulders burning, but says nothing. Her mother will laugh at her weak complexion. ‘Yes.’ Justine picks at the label of her bottle. ‘Was he there?’ Her mother watches her, tapping her long nails against the belly of her wine glass. Justine nods and rolls the strip of label into a tiny paper ball before placing it on the table. ‘No. We didn’t speak, really.’ Justine adds another ball to the growing pile. He brought their lunch in on a tray. Pork chops, mash, spring greens and gravy. The TV flashed and droned, the local news had started. ‘Oh, right. Hello, babe,’ the old man said, smiling towards her. She patted his hand. ‘He’s not really with it now. Are you, duck?’ her grandmother said. Justine blinked and looked out the window, embarrassed. They ate, the two old people, slowly, her uncle cutting up her grandfather’s meat and wiping the gravy from his chin. They chewed, gazing up at the TV, her grandfather, dozing off between mouthfuls, needing to be gentled awake. ‘You finished, Dad? Shall we go sit out in the garden for a bit, sit in the sun and have a fag?’ He helped him up, his arm around his father and they shuffled outside. She was taller than them both now, the only two men who had stuck around since her childhood. She cleared the plates and washed up, watching them through the window above the sink, both sitting on the bench, where her swing used to be. Her uncle had put a hat on her grandfather to protect his scalp from the sun. ‘It’s nice to see you, darling,’ he’d said as she left. ‘That’s ’cause the one I’ve got is a cutting from Granddad’s.’ She drinks her wine, emptying the glass. Memories dip and fall like the birds. She is sure that it is as simple as this – barefoot, summer heat, terrorised by fat insects and being very small. The roses, crumpled balls of white, red and pink, thorny like the forest guarding Sleeping Beauty. Stepping in amongst them, their cool dry absorption, going in further, the scent, caught in hair and on fingers, lingering too long, before turning and turning to retrace lost steps, suddenly scared, sure that she could hear a tiger or a monster, fingers worrying at the air, and hair, long strands, baby hair, tangled, caught, the cotton summer dress, too, snagged in the clasp of the rose bushes. And screaming and crying and struggling. 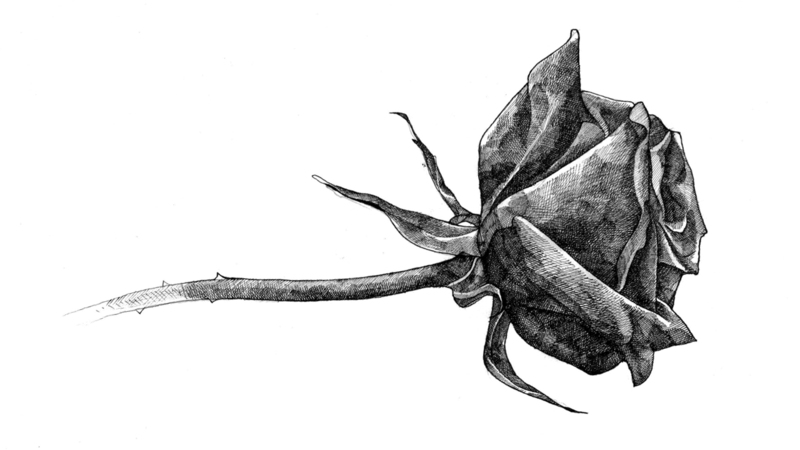 Then he came, Granddad, the roses only thigh-high, like a giant, pushing through thorns, crushing flowers to get to her. She remembers so clearly his fingers carefully untwisting her hair; his breath on her neck, so close, holding her to him. Him lifting her up, feeling the sharp bristles of his chest hair against her cheek, held far above the danger. The next day, he’d cut them all down. She is sure of all this. She has kept this tucked away, this knowledge of care and love. Knowing what it is to feel safe. They eat, leaving the burnt crusts on the plate. She drinks another beer; her mother has bought the wine bottle out with her and fills her glass. Justine shakes her head and shrugs. She is too hot, her clothes too tight. Justine nods. It’s easier to pretend. Her mother reaches for a cigarette then changes her mind. Her mother goes into the shed and returns with secateurs and a plant pot filled with earth. She reaches into the pocket of her shorts, pulls out a small white tub and puts that down next to the plant pot. ‘It’ll take me a few seconds, if that.’ She walks down the garden, her flip-flops slapping against the concrete path that threads through the lawn. Justine watches her inspect the plant before grasping a branch and snipping it from the bush. She walks back, holding it for Justine to see. ‘You have to cut it like that, see?’ Her mother points to the end, cut in a precise diagonal. She opens the small tub, dips the slanted end into the powder and plants it in the pot. ‘All done. Easy as that. Clever, huh? Same plant, just going to grow somewhere else. Like a clone, like Dolly the sheep. A chip off the old block.’ She laughs, a tight ball of sound. Justine feels heavy, as if there’s a thick vine coiling around her, fixing her in place. A dog barks in one of the other gardens. ‘You did your best, Mum. Georgia and I both know that.’ Justine flicks an ant from the table and takes a sip of beer. Then says it. Justine looks out over the end of the garden towards the back alley. She’d been kissed there, a long time ago. After school, walking home with Jennifer; it was near Christmas, cold and dark. They were fifteen. She could taste licorice on Jennifer’s lips. They barely looked at each other the next day and stopped hanging around together soon after. There are other memories; of knives kept next to beds, of her mother being dragged down the stairs by her hair, of coffee mugs exploding against blue kitchen walls, of moving in with her grandparents, then to the women’s refuge, then back to her grandparents’. Her sister wrapped in a blanket in her mother’s arms. Hiding behind the sofa with all the lights off, shushing the baby whenever someone knocked on the front door unexpectedly. Her sister, standing silent in the corner as Justine took a beating for a missing ten pound note. Her sister’s dad, and the one before that, and the one before him and the ones that came later. She draws a circle in the dust on the table. She nods and attempts a smile at her mother. She could tell the police that she knew what men could do to little girls way before her sister was born and though he'd gone by the time Georgia had come, she'd kept watch, and protected her, she'd been sure of that. She knew never to leave her sister alone with a man, not even Granddad or Uncle, but especially not one of Mum’s boyfriends. She’d done her best. She had been sure of that. Now what had she become? An unbeliever, as bad as a perpetrator – worse, even. Perhaps she hadn’t protected her sister after all; perhaps she’d been wrong all along. Her mother lights up a cigarette. ‘I’d better be off then, before the traffic gets bad.’ The daughter pushes back the chair and stands, her skirt clinging to the back of her legs.